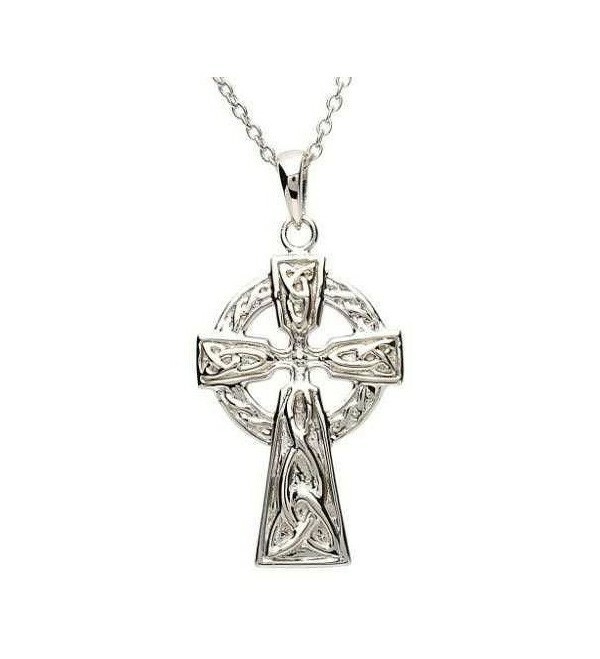 A beautiful showing of faith and spiritual awareness, this gorgeous Shanore necklace features an intricate inlay of Trinity Knots delicately carved out of sterling silver within the traditional Celtic cross design. A beautiful showing of faith and spiritual awareness, this gorgeous necklace features an intricate inlay of Trinity Knots delicately carved out of sterling silver within the traditional Celtic cross design of a ring encircling the sections where the stem and arms of the cross intersect. Includes 18-inch silver chain. 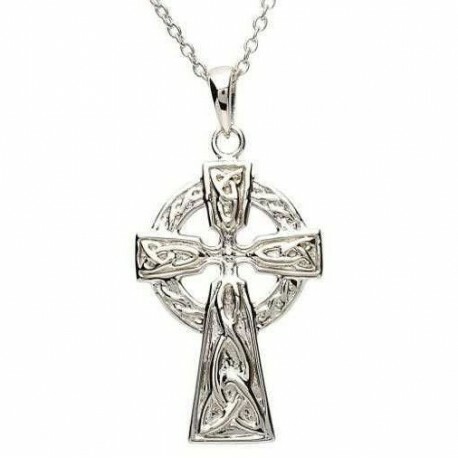 The Celtic cross is recognized worldwide and has served as a symbol of faith and honor since early high crosses were erected in the 8th century. During the Celtic Revival in the middle of the 19th century, elaborate Celtic crosses and the Trinity Knot, which denotes the teaching of the Holy Trinity, became a few of the most recognizable symbols of Celtic heritage in the days of early modernization in Ireland. A Celtic cross is a must have in the jewelry collection of a modern woman who recognizes the spiritual significance and importance of history to present day living. This stunning and detailed pendant makes a statement all by itself, and will look brilliant set against a classic black turtleneck or when worn with a tailored shirt and cardigan.